Cinco de Mayo, which marks the surprise defeat of Napoleon III in Mexico in 1862, has become a celebrated foodie holiday — but it’s no surprise that lard remains a staple of traditional Mexican cooking, especially at those Los Angeles and Orange County establishments showcased on a special Coast Packing Company online gastronomic “taste map,” prepared for the occasion. In this installment of “Taste the Difference,” Coast Packing — the leading supplier of animal fat shortenings in the Western U.S. — is again putting its website (and #FatMap) where its taste buds are. 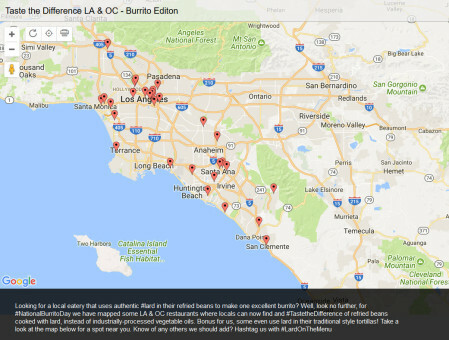 Coast has #FatMapped restaurants and eateries throughout Los Angeles and Orange counties, spots where locals can taste for themselves just how lard brings out the best in burritos, tacos and refried beans. Among the can’t-miss places: El Tepeyac Café in Boyle Heights, home of “Manuel’s Special” burrito, weighing in at more than 5 lbs. El Tepeyac has been featured on the Food Network, Travel Channel’s “Man vs. Food,” and more. Also on the map: Gilbert’s El Indio, Yuca’s, Al & Bea’s, Lupe’s #2, Tito’s Tacos and La Indiana Tamales, among roughly two dozen others. Have a favorite restaurant that puts lard or beef tallow on the menu (or just in some of its prize dishes)? If so, drop Coast an email at info@coastpacking.com and the company will put it on the #FatMap. Consumers can also post an image or link to via Twitter/Instagram/Pinterest, etc., with the hashtag #LardOnTheMenuor or #TallowOnTheMenu.